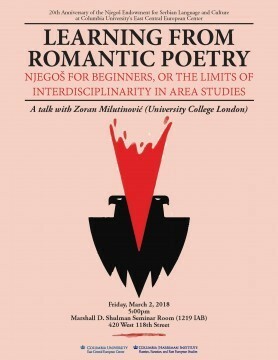 Please join Harriman Institute and the Njegoš Endowment for Serbian Language and Culture at Columbia University's East Central European Center for a talk with Zoran Milutinović (University College London). As former ‘language and literature’ academic programs either disappear or morph into area studies programs, literary scholars find themselves in a position where they have to either simplify their complex methodologies, so that they can be fitted into a version of area studies shaped by social sciences, or risk witnessing them disappear altogether. As such, the academic field which pioneered complex and sophisticated methods of textual interpretation, such as deconstruction or new historicism, begins to conform to the understanding of literature – its nature, purpose and function – that is prevalent in the social sciences which still advocate the model of mimesis as simple reflection. Using P. P. Njegoš’s Mountain Wreath as an example, this talk advocates a more confident way of fitting literature into area studies: literary studies, with their long and complex history, have more to offer to area studies than just consenting to literature being read as an illustration of historical and social processes. Zoran Milutinović is Professor of South Slav Literature and Modern Literary Theory at University College London, and member of Academia Europaea. To view the event page at harriman.columbia.edu, CLICK HERE.